Drive in style on highways and trails with an aggressive all-terrain tire built for both adventure and looks. 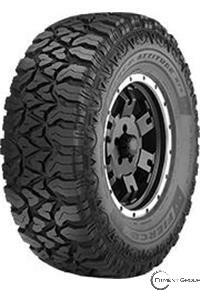 Rugged mud terrain tread pattern helps provide traction in deep mud conditions. Staggered shoulder blocks to help enhance grip for off-road driving. Rim flange protector helps protect rims from accidental curb damage. Contemporary sidewall design for enhanced on-vehicle appearance.